News agencies have reported that a large number of worshipers were injured on Sunday morning 26/7/2015 after Jewish forces supported by special units stormed Al-Aqsa Mosque, through the Moroccan Gate, to secure the entry of settlers and their celebrating of their alleged “Tisha B'Av” as it is called. On Sunday, Almorabitat (the stationed women of the Aqsa compound) topped the scene during the transgressions against the Al-Aqsa Mosque compound both within the Aqsa and at its gates after being barred from entering. They were assaulted and some were arrested. Daily attacks on Al-Aqsa continue under the plain sight of the Islamic and international world, and we see women opposing them and defending the place of Israa’ of RasulAllah (saw) in a scene that has become common and a passing story on the news! 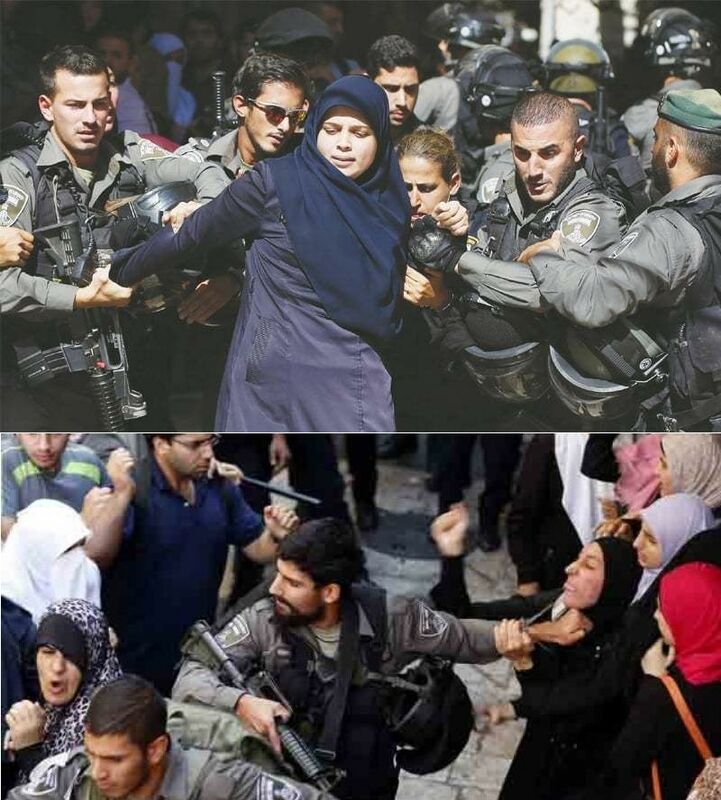 Women are humiliated, beaten, detained, imprisoned and expelled from Al-Aqsa for varying periods and the so-called men, from the rulers and leaders, are hiding behind the drapes of opulence, humiliation and failure. Women came out from their Khadoor (dwellings) after they had despaired that the likes of Al-Mu'tasim will heed their call. Women left their hair accessories and kohl jars and went out as defenders for Al-Aqsa with their bodies and their thundering voices with Takbeers in the faces of the sinful aggressors. Some women cover their faces for fear of arrest; however, it is more fitting that the leaders and rulers cover their faces out of humiliation, disgrace and shame! Oh soldiers and officers of the armies in the Islamic world: How degrading! Do the scenes of those unarmed women and their taking up your role in the defense of Al-Aqsa not hurt you and bleed your hearts! How can you bear seeing the Jewish soldiers and their impure hands extend to the Muslim sisters in humiliation, beatings and arrests while you stand submissively weak! How can you be satisfied that your role and the use of your weapons is restricted to military parades and the protection of the Excellencies and Highnesses and pursuing the one who says my Lord is Allah! Is there no longer in you the bravery of Al-Mu'tasim and the manliness of Khaled and Salah al-Din! Are you content with the medals, titles and ranks hanging from your shoulders after every attack on your brothers and sisters in Deen instead of your weapons pointing toward the enemies of the Deen! Or are you going to be satisfied by the issuance of flimsy denunciations and condemnations from some of the leaders and rulers, and say that we do what we are ordered to do! An older proverb says "if a person is safe from punishment he will misbehave", and we had enough of the Jews crimes and their insults to Allah and His Messenger, His Deen, His holy sites and His worshippers without punishment or accountability, so what are you doing?! The land of Jerusalem that the companions and later your fathers irrigated with their blood and money in defense of it, you see it today desecrated; its land, its resources and its women, and you do not move a finger! What will you say when the Lord of Glory asks you and accounts you of your abandonment of the land of Islam and your requesting honor from the Kuffar and Mushrikeen, while Allah has made the honor belong to Him, to His Messenger, and to the believers ?! Go back to the honor of Islam and discard your pride with sin and the like, and you will return to becoming the masters of the world instead of being its slaves. But if you are not from its people, than leave it for its people. And if you lose your manliness and your chivalry, the sisters of men will remain outside their Khadoor (dwellings) replacing you and taking your role in the defense of the place of Israa’ of RasulAllah (saw)! "اللہ اپنے امور پر غالب ہے لیکن اکثر لوگ نہیں جانتے"